GOKOVA is one of the Turkey's biggest kiteboarding schools. Taking advantage of some of the best conditions in Turkey, our aim is to offer unrivalled standards of tuition and service, using the most up to date equipment available, together with an instructor team of the highest calibre. All kiteboarding courses are taught by International Kiteboarding Organisation qualified instructors and we teach to set standards to ensure that you are given the best learning experience possible. 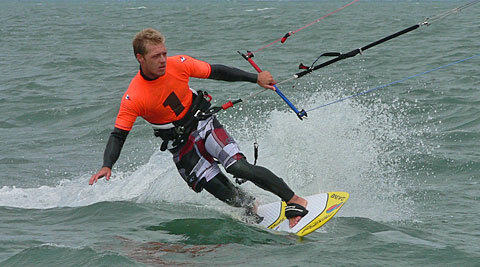 As with a lot of extreme sports, kiteboarding is not without its dangers unless practiced correctly. Being 3 km. long, with max 50 cm depth in 150 meters without even a small stone makes this calm sandy beach top ranked in kiteboarders' choice. Whether you come here to join a kiteboard course or just for some relaxing sessions on your own, we can arrange your accomodation and transfers. For the rest of your holiday you can join many other activities that we offer with your friends or family. Please make reservation at least 2 weeks before if you do not bring your own kite and board.